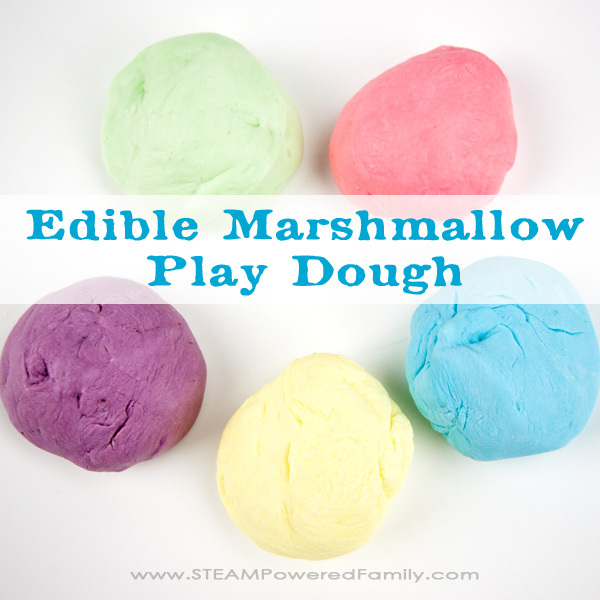 Recently we made a marshmallow edible play dough that my youngest loved! My oldest wasn’t as fond of the taste but he was obsessed with watching the process. See while making the play dough the marshmallows do some crazy things. But why? And how could we turn it into something really fun? 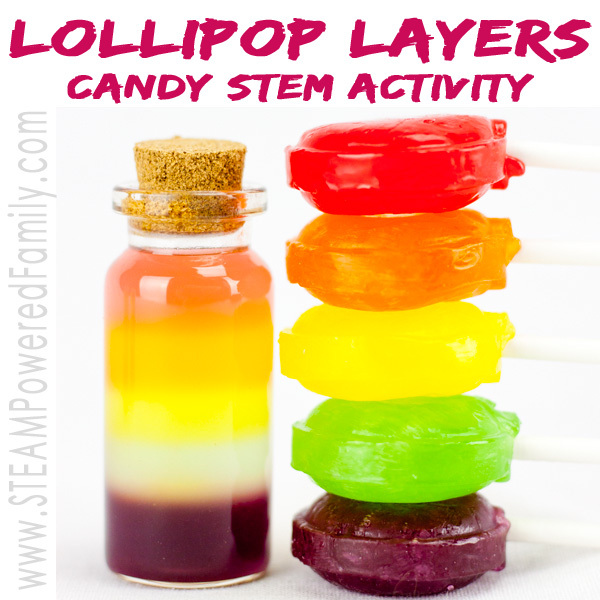 That was the big question that lead to this science experiment and STEAM activity. I always love it when my kids create their own science experiments. They see something and it raises questions. Over time they have learned that they can take those questions and turn them into new activities and studies. 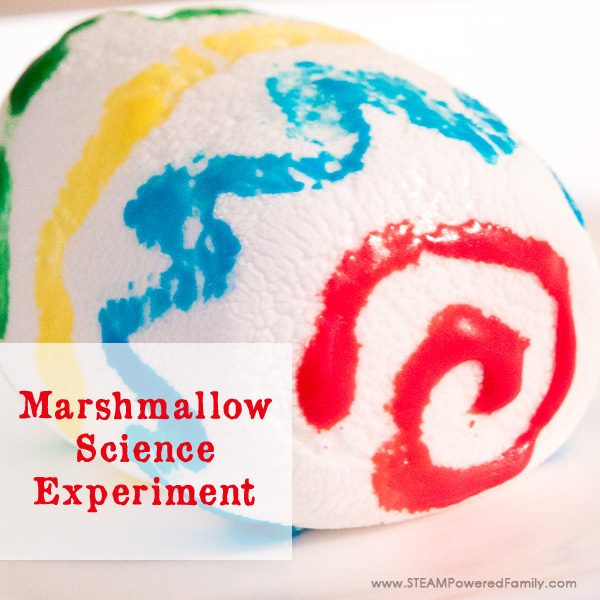 That is exactly what happened recently when we made Marshmallow Play Dough. See while warming the marshmallows in the microwave they got really, REALLY BIG! With a bit of research we discovered the science behind what was happening. 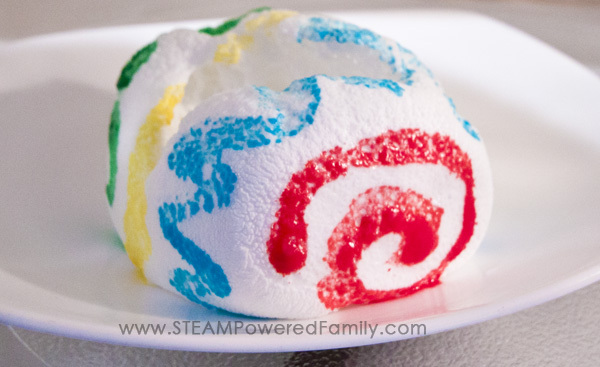 Marshmallows are a whole lot of sugar, water and air bubbles. 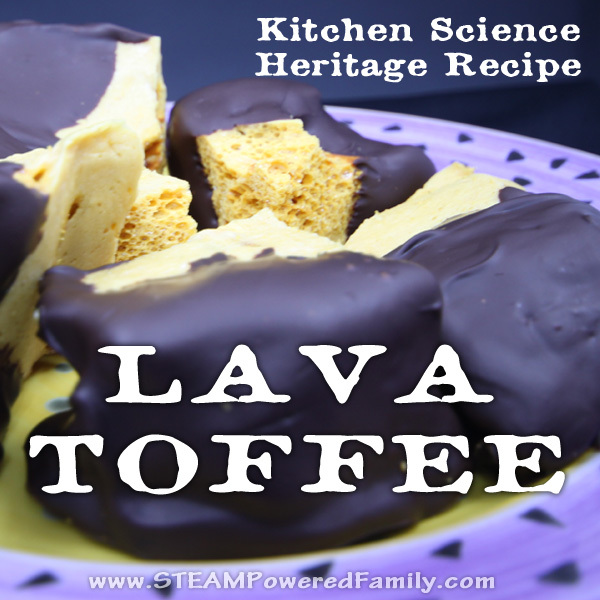 When you heat marshmallows in a microwave the water molecules vibrate very quickly which makes the water heat up. This in turn warms the sugar (causing it to soften) and warms the air in the bubbles. 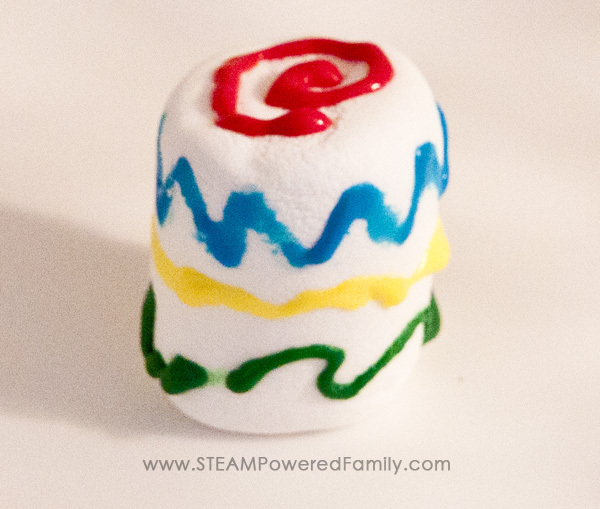 Since the warm air is trapped in side of the marshmallow bubbles (think of those marshmallow bubbles like little balloons), the heated air molecules get excited and move around faster, pushing against the marshmallow walls. Since the warmed sugar is softened the hyperactive air molecules push and stretch the sugar. This makes it puff up. 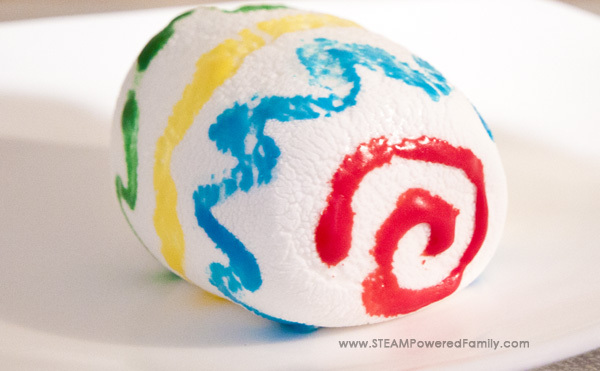 If it puffs up too much, some air bubbles burst, and the marshmallow ruptures. Once the marshmallow starts to cool it deflates like a popped balloon. So now we know the science, it was time to conduct an experiment! The first step was a bit like decorating Easter eggs. We used our Icing Writers and decorated our Marshmallows. 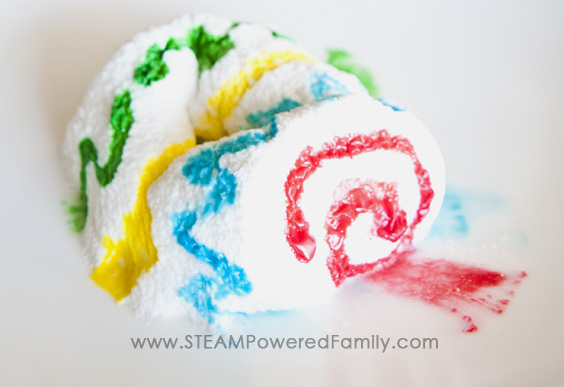 This can be done with food coloring if you wish but we found that method really messy (and frankly I dread cleaning up food dye!). The Icing Writers did a beautiful job and kept the mess fairly contained. Once our marshmallow was decorated we placed it on a large plate and set it in the microwave. We then turned on the microwave and watched closely. Within seconds our marshmallow started growing. Then it tipped over as the ends expanded and started to round. And it grew some more, and more! We developed a bit of a game trying to stop the growing marshmallow just before it split. If you over cook them they will start to turn brown inside. This the beginning of the caramelizing of the sugars. Finally we watched the changes that occurred as it cooled and deflated. You can see on the plate how much it shrank back down from it’s largest size. We also explored how sticky and soft the marshmallows were when first out of the microwave and how they hardened as they cooled. This is caused by the sugars warming and cooling. 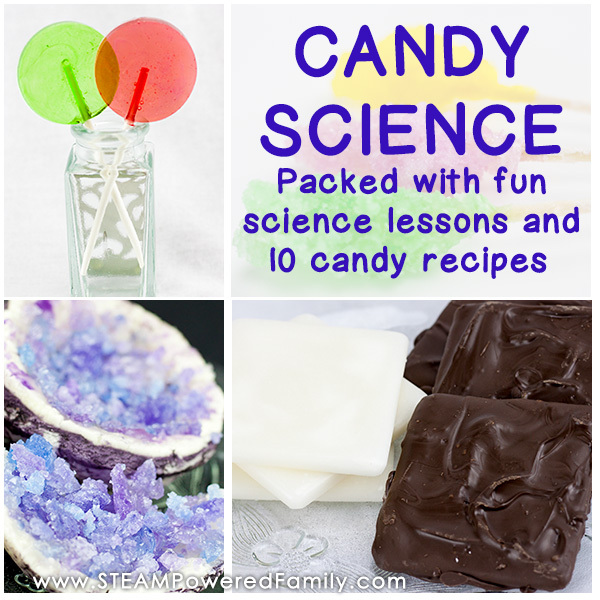 Of course, when we were all finished, we ate our science experiment!